Camille introduces a new level of high-risk counterplay. We’ve just gotten used to the assassin rework that changed up classic champions like Katarina, Talon, and Rengar, and now a new champion is swinging in to say hello. 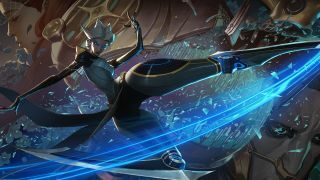 Camille, the Steel Shadow, is League of Legends’ new champion, and the developers have mentioned that in some ways she operates as an anti-assassin. She’s very interesting, design wise, in both terms of lore (including voicework, visual design, and what she means for other champions) and in-game abilities and capabilities. While her kit is, at first glance, incredibly simple (especially compared to some recent releases) there’s a lot of room for maneuvering and outthinking an enemy. With the assassin class changes complete, Camille is here to lock them down and provide a counter. She’s classified as a fighter, but she may end up thriving as a deliberate counterpick. Let’s take a look at this champion and how she’s taking League one bold, knife-footed step forward. When Riot took a look at assassins across the board, they realized that there was no way to feasibly allow them to continue to blow up targets with no ability to fight back. Assassins have had that one-shot potential lowered across the board. In return, they now have access to more tools. LeBlanc can fake out enemies by spawning a global clone, Talon can leap over walls to set up ambushes or escape sticky situations, Katarina has more sustained damage with tons of mobility, and so on. Camille is a response to that. Talen wants to vault over walls? Well, he’ll have a rough time doing that if trapped in Camille’s ult. Katarina’s hopping around and throwing down sustained damage? Camille can shield against her. Rengar’s leaping away? She can pursue with her hookshot. In the lore, she’s an assassin herself, but in-game she seems almost like a more versatile, less focused Fiora. The end result is a champion that’s big on relentless pursuit with a high skill ceiling. Camille herself is a perfectionist, and each ability has an optimal and suboptimal use. Players will need to be patient, and try, try, again. Find out more about the ramifications of League's most recent update right here. You can find video example of Camille’s kit at the official reveal page, but I’d like to take a look at those abilities and how they tie into her overall theme. Her passive is Adaptive Defenses. When Camille attacks an enemy, she gets a shield based on her HP that defends against their primary damage type. If she kicks a mage, she’s defended against magic damage. If she kicks a fighter, she gets a shield for physical damage. Here’s the catch: the shield holds for a few seconds, expires, and then allows her to reset it again. This means that she’s good in one on one fights, but in a team fight, she needs to figure out who’s going to blow her up and shield against it. If she fails, she loses a huge chunk of her survivability for the few seconds it takes to reset, and she’ll likely fall as a result. Tactical Sweep is Camille’s W. She takes a moment and then fires energy in a short cone. Everyone in the cone is hit, but the outer edge of the cone is the sweet spot. If Camille can land a hit in the cone’s outside radius, the enemy is slowed, takes extra damage based off maximum percentage health points, and Camille heals. Camille’s E was heavily previewed in her reveal comic. Hookshot is a series of two skill shots. The first skill shot, if it connects with a wall, pulls Camille to it. The second one activates after that. Wall Dive launches Camille forward. If she hits an enemy, she stuns everyone around them. She can also use Wall Dive to escape, but the range and her launch speed is lower. The possibility for failure here is clear: first of all, there’s always a risk with skillshots. Anyone who’s ever placed a ward outside a bush in lane knows how even simple shots can betray us. Secondly, Camille’s escape potential with E is deliberately suboptimal. She’s rewarded for chasing, and if she has to use Wall Dive to get out, she’s already in trouble. Finally, there’s her ultimate. Hextech Ultimatum locks one character down, putting them in an inescapable zone and knocking away their allies. While Camille is inside the Ultimatum, her attacks do bonus damage to the poor sucker caught inside. If she leaves the zone, it cancels. You can’t blink out, Flash out, tumble out, or escape by any other means. Camille will have to choose the right target, and the right time to lock them down. If she blows it too early, the fight can move on without them. If she traps them too late, it’s a wasted cooldown. Camille’s entire kit is based around doing the right thing, at the right time, under a great deal of pressure. It’s fitting, considering her role in the lore. She serves a mysterious force. She has to make decisions as to the good of the city. On the Rift, she fills a similar role. Who do you eliminate? Who is your greatest threat? The assassins may have risen up, but Camille is there to meet them and stop their charge. While she’s not the strongest one on one duelist in the game, her sustained damage throughout fights and mobility make up for it. Will you be giving Camille or a shot, or will the pressure prove too much as she steps onto the Rift?